Let’s pop some bubbles, mix a cocktail and celebrate the upcoming Valentine’s Day with some healthy guts and cheers. Ben and I have never really been a couple that focuses on the red hearts, boxes of chocolate, or big fancy dinners out. More often than not it was because long distance while we were dating, or our differing schedules didn’t allow it. But I will never turn down a kiss, a bouquet of flowers, and a cocktail on Valentine’s Day! Whether you’re celebrating it with someone special, your girlfriends, or just solo, be sure to celebrate love in some form, and sip something special. 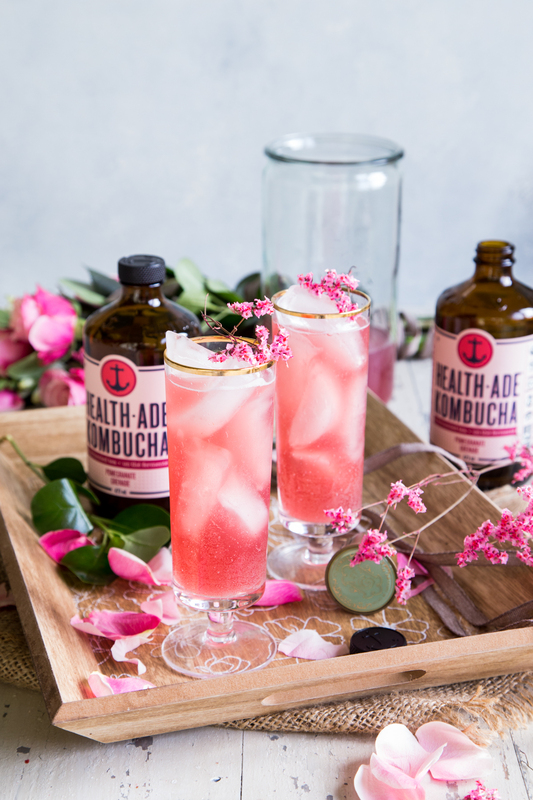 For the next year I am really thrilled to announce that I will be bringing you new health inspired recipes and fun creations with my favorite kombucha company, Health-Ade. 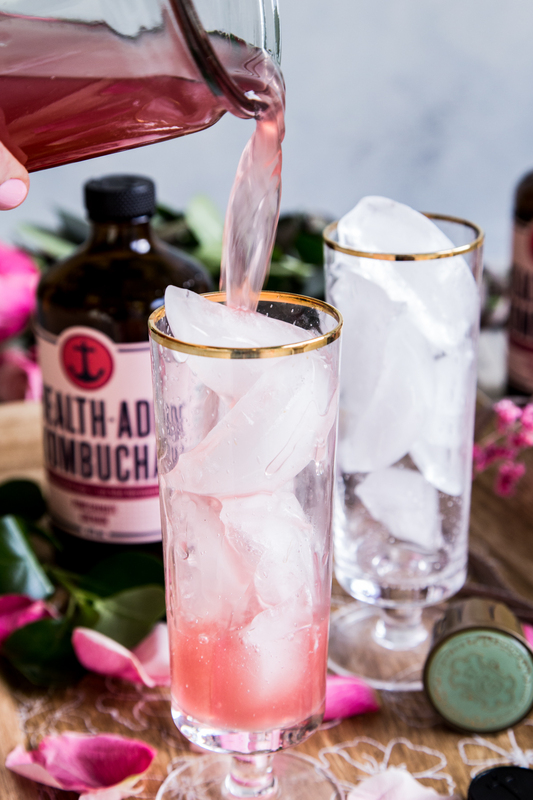 I was a fan before I ever dreamed of teaming up with this thriving company, whose mission is to bring flavor and fun to their small batch fermented teas, where they focus on fresh flavors and quality ingredients. Each and every kombucha batch is fermented in 2.5 gallon glass jars, not huge vats or tanks! A few years ago, when they were still an emerging name in the market, I was lucky enough to meet Daina, one of the founders, in California! I was there for a blog retreat, and we met, mixed cocktails, and had a great time learning about her mission for inspired, centered living. I came away excited for more and instantly became a lifelong Health-Ade fan. I’m so pleased at the way they have catalyzed their brand and are reaching new people in exciting new ways. They even teamed up with Tone It Up for a custom flavor that we will get to highlight here! But with Valentine’s Day around the corner, my first recipe is to share their tried and true pomegranate flavor! 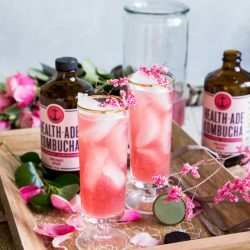 Pomegranate is a staple of their kombucha line, and it is tart, tangy, pink, and slightly sweet. 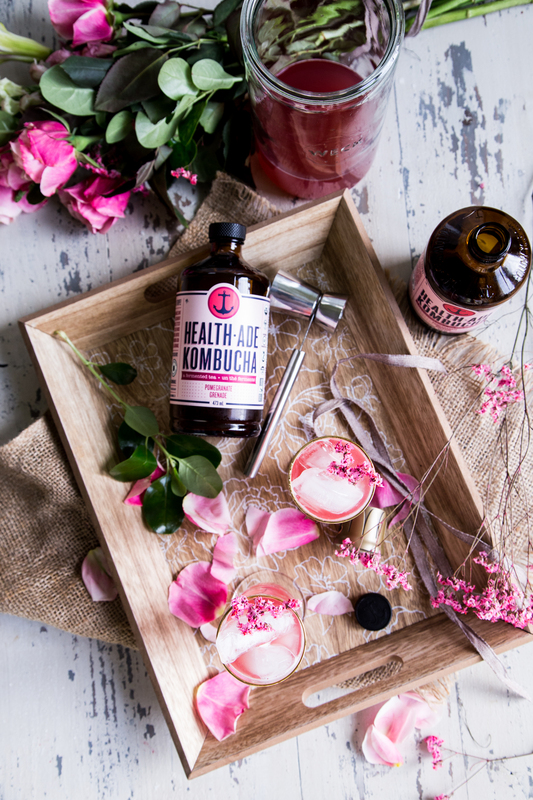 It’s a lovely blend and balance, and this pomegranate and St. Germain spritzer is one heck of a way to celebrate the day of love and promote a centered food mindset with fermented teas. I love celebrating the hard work of women who have taken the reins and really committed to their craft. While there will be sponsored posts throughout the year, I go into this mission emboldened to showcase brands I love in my daily life, and hope that you will give them a try and add them to your routine also. If everything in life is about balance – I will never turn down a slice of chocolate cake – I want to be equally indulgent in everything life offers, and be centered in myself and my health as well. So thank you for supporting me, and allowing me to help showcase brands and products I truly enjoy. And while you’re at it, mix a cocktail and share it withsomeone special! In a pitcher, combine the Health-Ade Pomegranate Kombucha, sparkling wine, St. Germaine, and pomegranate juice. Gently stir the drink and adjust the flavors as necessary to suit your taste. Add in pomegranate seeds to the mixture and allow to float on top. Fill four glasses with ice, and pour the cocktail over the top. Garnish with additional pomegranate seeds and edible flowers for fun. Serve immediately. *Fine Print* This post is sponsored by Health-Ade, as part of an ongoing ambassadorship with the brand. All opinions and content are my own.